Tired of lag and poor frame rates? 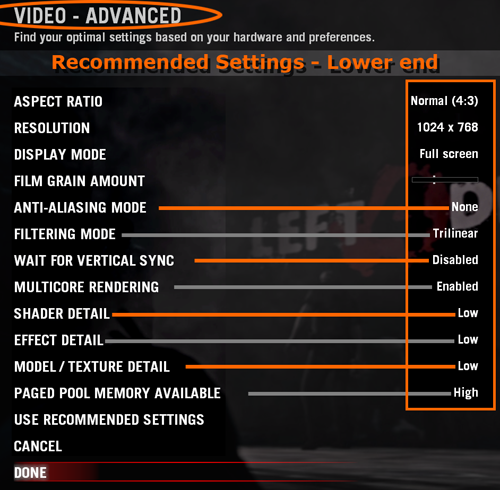 This Left 4 Dead performance guide goes over the "advanced video settings" you'll need to know to increase FPS in both Left 4 Dead and Left 4 Dead 2. Alright, to get started you'll obviously need to run Left 4 dead. Select: "Options" from the Left 4 Dead Menu then select "Video". Now, before tweaking any video settings manually, select the "Use Recommended Settings" option. 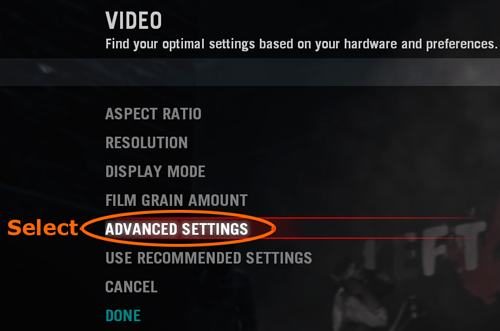 This will help provide us with a decent base to tweak your video settings from since I have no way personally of knowing exactly what computer hardware you're running with. Once you've selected that, go ahead and select "Advanced Settings" as per the image below. The problem Vertical Sync is that the second your video FPS (frames per second) dips below your monitor's refresh rate, your FPS will be cut nearly in half! This setting is a "must" disable unless your system is an absolute powerhouse, and is the most critical option for improving performance in Left 4 Dead. This setting allows users with multicore computer processors (dualcore, quadcore etc) to force Left 4 Dead to use any/all processors available in the system to increase performance and FPS. This option is specific to your graphic card's performance. Shaders control various texture details of Left 4 Dead such as specular surfaces (glossy wet look) or advanced per pixel lighting information that may be stored. High "Shader Detail" can be a huge performance hit if your system is unable to handle it. If you're looking to optimize Left 4 Dead for maximum performance, set this option to "Low". This setting does exactly what it says. It controls the amount of texture detail on game models, like "Zoey" or "Bill". Left 4 Dead was well coded, and even on "Low", models still look pretty nice. Unless you can handle it, "Low" for now. This option allocates a certain level of RAM or Page memory (Swap File) to be used during Left 4 Dead to store game information. If you can, "High". The more memory you have available, the better. Make sure to disable any unnecessary programs that may be running in the background before starting Left 4 Dead. If you're experiencing lockups due to memory problems, see this article. I highly recommend that people who are having performance issues in L4D download my Left 4 Dead Config or Left 4 Dead 2 FPS config. Read up on our Mouse Related tweaks too!